Assorted Notions: So? What else is new? There's yet another news article that discusses how sewing/knitting/crafts are hip now and not just for your grandmother; this one was published in the NY Times. Of course this isn't news to you or me, but still I'm glad it's among the most popular emailed stories of today. Progress has been made on the BWOF blouse; all that's left to do is make the drawstring for the neck, make the belt, and sew on 7 snaps. So far so good. 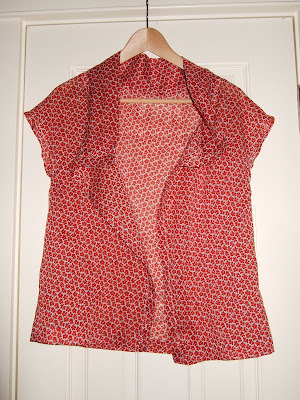 The only tip I have so far, if you make this, is remember that the armholes are cut slightly on the bias, and so you should be careful not to pull them too taut when hemming them (which results in a wavy hem) as I did.